Hedge Fund-Backed Castellan Real Estate Group Intimidates NYC Tenants to Vacate Rent-Stabilized Apts | Democracy Now! AMY GOODMAN: Juan, before we start with the main segment of today’s broadcast on the Israeli elections, you have a very interesting piece in the New York Daily News on hedge fund takeovers, following our last headline of housing. JUAN GONZÁLEZ: Yes, well, it’s not only happening with Blackstone, in other parts of the country and in Spain, but right here in New York City. I’ve been reporting now for a couple of years about one particular real estate firm, Castellan Real Estate Partners, which is also backed by hedge fund money and which has been buying buildings all around New York City, especially in gentrifying neighborhoods, in Harlem and Washington Heights and in Brooklyn. And I reported two years ago that what they were doing when they took over the buildings is they would immediately, mostly—they’re mostly immigrants who are in their buildings, rent-stabilized buildings. And what they would do is they would immediately demand proof of citizenship, certain levels of income, which you cannot do in New York state once you’re already in a building. You can’t suddenly demand to see proof that you’re legally in the country or that you have a certain income level. 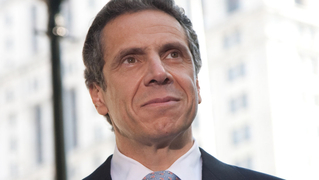 As a result, the governor of New York, Governor Cuomo, did an investigation. His Tenant Protection Unit placed the company under an independent monitor in January of last year and ordered the company to reinstate any tenants that they had evicted previously improperly. Well, it turns out, a year later, even with a state monitor, Castellan continues to systematically force its tenants out of its buildings in order to jack up the rents. I was able to obtain a private, confidential report to its investors, where the company boasts, building by building, how—when did we buy the building, how many tenants have we managed to get out, renovate their apartments. In one building in Harlem on 141st Street, they bought the building in 2009, 30 apartments. Twenty-eight have been emptied and renovated, and they’ve been able to drive the rents up by an average of 50 percent per unit. But they go through, building by building, what they called “enhancement of value” of their properties, of their portfolio. AMY GOODMAN: And especially if people are undocumented, they would be afraid to challenge. JUAN GONZÁLEZ: Right, and they’ve also—in the one tenant meeting that I attended, the superintendent immediately tried to end the meeting, told the tenants, “You rent your apartments. You cannot rent the hall and then have a meeting in the hall to discuss your problems,” and ordered the meeting ended. And so, that there are major problems in these buildings. But this is happening with a state-appointed monitor, supposedly, in the offices of Castellan. So you see that the major problem, that so many New Yorkers say that the rents are too high, this is what’s driving up the cost of housing in New York, these private equity firms that are continuing to buy up buildings, drive out the old tenants and seek to double the rents, sometimes 50 percent, 100 percent increases. NEXTAfter Netanyahu Wins Israel Vote with Racism & Vow of Permanent Occupation, How Will World Respond?